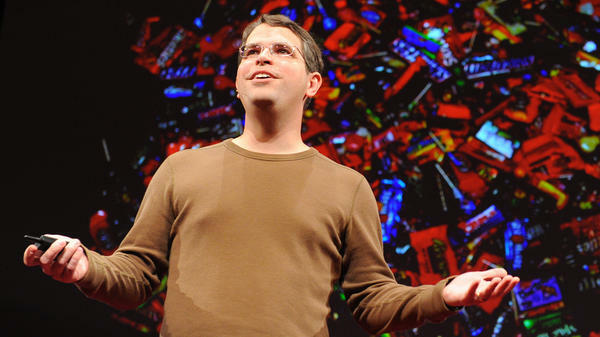 Matt Cutts on the TED stage. Matt Cutts is the acting administrator for the U.S. Digital Service. In the past, Cutts was an engineer at Google specializing in search engines. He wrote the first version of SafeSearch, a filtering program, and helped Google cut down on link spam. It's the TED Radio Hour from NPR. I'm Guy Raz, and on the show today ideas about becoming better versions of ourselves. And as we just heard from Emily Balcetis, motivation, it can be the key to getting there, especially when you're trying something new. MATT CUTTS: Tried to write a compliment for my wife each day, tried to eat more slowly and mindfully, tried to have fewer meetings. RAZ: This is Matt Cutts. CUTTS: Cooking one dish each day, exercise twice a day, pick up the ukulele and play it for 10 minutes a day. RAZ: Matt used to be an engineer at Google. CUTTS: And now I work at the U.S. Digital Service. RAZ: And all those things Matt just listed, they're things that he's actually done for at least 30 straight days. OK, so are you basically perfect? CUTTS: Do I look perfect to you? Come on. RAZ: You seem pretty perfect. RAZ: Matt sort of sees himself as an experiment, a work in progress. And his obsession with trying new things, it all started a few years ago after he watched a TV show called "30 Days." MORGAN SPURLOCK: Hi, I'm Morgan Spurlock. RAZ: And on each episode the host, Morgan Spurlock - you might remember him from the movie "Super Size Me" - Morgan would spend 30 days immersing himself in a totally different lifestyle. CUTTS: So I decided to follow in the footsteps of the great American philosopher Morgan Spurlock and try something new for 30 days. RAZ: Matt describes what happened next on the TED stage. CUTTS: The idea is actually pretty simple. Think about something you've always wanted to add to your life and try it for the next 30 days. It turns out 30 days is just about the right amount of time to add a new habit or subtract a habit from your life. There's a few things that I learned while doing these 30-day challenges. The first was instead of the months flying by, forgotten, the time was much more memorable. I also noticed that as I started to do more and harder 30-day challenges my self-confidence grew. I went from desk-dwelling computer nerd to the kind of guy who bikes to work for fun. Even last year I ended up hiking up Mount Kilimanjaro, the highest mountain in Africa. I would never have been that adventurous before I started my 30-day challenges. RAZ: That is impressive, Kilimanjaro. So basically every 30 days - and so what are you trying out now? CUTTS: I am trying to practice gratitude. So every day I try to think of one thing I like about myself, about the world and about someone else. RAZ: So how do you remind yourself to do this every day? You wake up and say, I've got to remind myself to show gratitude? CUTTS: One trick that I have found is get a calendar and get a marker. And you basically say, I have to mark an X at some point today on that calendar. So you get a streak going. And at that point you're like, I got to keep my streak going. And so you can't go to sleep until you mark your X on the calendar by doing that activity that day. RAZ: Tell me this idea behind 30 days. Why 30 days? Why not seven days? Why not 20 days? CUTTS: Well, it needs to be something that easily slots into your mind. And people say that to learn a new habit can take anywhere from 21 to 45 days. But those are really weird numbers, right? Thirty days is super easy to remember because you just - when a new month rolls around you're like, OK, it's time for a new habit. RAZ: So do you plan ahead? Like, what are you going to do for the next month? CUTTS: So I have found that you don't want to plan ahead too much because then you start to feel guilty. You don't want to do New Year's resolutions where they're planned out 12 months in advance. So normally around the end of the month, about a week left, I'll start just opening myself up to ideas and suggestions. I'll be like, you know, what am I noticing? When am I not feeling good? You also have to be OK with failure. There's a lot of habits that are not going to take. CUTTS: I tried meditation for a month. It was awful. CUTTS: I did it for 30 days. And I tried to meditate for 15 minutes a day. RAZ: And it was torture? CUTTS: It was so painful (laughter). I hated it. RAZ: What happened when you meditated? CUTTS: My brain went crazy and I got frustrated. And eventually I learned I could go outside and I could, like, count the leaves on trees. And that was somewhat calming. But I'm going to have to do it again because apparently I don't have a meditating personality. RAZ: You've got to follow the breath, Matt. RAZ: You've got to follow the breath. CUTTS: Inhale breath, exhale stress. RAZ: You've got to follow it all the way through your body. CUTTS: You know, a lot of people - it works for them. RAZ: Did you ever, like, give up gluten or do anything like that for a month? Like, give me a story. CUTTS: Yes. I did try going vegan for a month. RAZ: Why? Why did you become a vegan for a month? CUTTS: Because we should all be re-examining our assumptions, right? And in 50 years, what are the beliefs that we have that are going to be proven wrong? And maybe one of those beliefs is, you know, whether we should be eating meat. For example - right? - you know, you can look back at people like Thomas Jefferson, and it's very clear with the benefit of hindsight and history, oh, they were doing some things that modern day people wouldn't approve of. So you can take a step back and think and say, what would I be doing today that 50 years from now people wouldn't approve of? And it seemed like going vegan was a good chance to try that. RAZ: I mean, so say, you know, somebody listening wanted to just try this out, right? How should they go about it? Like, what should they do? CUTTS: Well, I love when people think about things they've always wanted to try and just give it a shot. But there are some really easy ones that you can start with. So for example, try just taking one picture every single day for 30 days. And what I found when I did that challenge is that I was more likely to remember each day and be able to mark the time. And I remembered a few things that I would have forgotten otherwise. You can do that. You can give up television. You can try to just go for a walk every day. And don't - you don't have to put a number on it. You just have to say, I'm going to go for a walk. Or I'm going to tell my wife something that I love about her. They can be totally simple. They don't have to be hard. They don't need to be ambitious. It just needs to be something that you think you might want to do. And then you can try it on for size. RAZ: By constantly seeking to improve yourself, does it also give you a perspective on how imperfect you are and how flawed you are? CUTTS: (Laughter) Yes, absolutely. No, there are a lot of people who can do things so much better than I can. But even if I come in 109 out of 111 in a triathlon, I feel like I still beat the people who stayed on the couch that day. RAZ: And is there something innate, something about us as humans that drives us to seek self-improvement? I mean, do you think it's an inherent human trait and desire? CUTTS: I don't know whether it's inherent or not. But I do know that when you see someone striving, a lot of people are interested in that. And a lot of people are attracted to that. And a lot of people want to be that person's friend or follow them along or go along for the adventure. Whenever you see someone doing something crazy, rowing across the Atlantic or something like that, they want to learn more about it. And so I don't know whether it's inherent. But I do think that everybody understands the appeal of striving for something new. A lot of people say that whenever you are hopefully resting very contentedly on your deathbed, you'll look back on your life. And current projections say people probably spend two years of their life on Facebook, you know? And if you think back, what are you going to regret? You're going to regret the things that you didn't try. RAZ: That's Matt Cutts. You can hear his entire talk at ted.com. Transcript provided by NPR, Copyright NPR.